Kanemitsu, T. Kanie, O. Trends Glycosci. Glycotechnol., 1999, 11, 267-276. Yuasa, H. et al. Trends Glycosci. 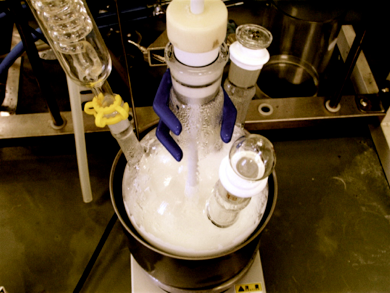 Glycotechnol., 2002, 14, 231-251. Kamitakahara, H. et al. Angew. Chem. Int. Ed., 1998, 37, 1524-1528. Sun, X.-L. et al. Eur. J. Org. Chem., 2000, 14, 2643-2653. Guo, C.-T. et al. Glycobiology, 2002, 12, 183-190. Takebayashi, M. et al. J. Org. Chem., 1999, 64, 5280-5291. Saotome, C. et al. Bioorg. Med. Chem., 2000, 8, 2249-2261. Saotome, C. et al. Chem. Biol., 2001, 8, 1061-1070. Nakahara, T. et al. Carbohydr. Res., 2008, 343, 1624-1635. Shimamura, M. et al. Eur J Immunol, 2004, 34, 735-742. Okamoto, N. et al. Chem. Biol. 2005, 12, 677-683. Kanie, O. et al. J. Am. Chem. Soc., 1994, 116, 12073-12074. Kanie, O. et al Tetrahedron Lett., 1996, 37, 4551-4554. Ito, Y. et al. Angew. Chem. Int. Ed., 1996, 35, 2510-2512. Kanie, O. et al. Angew. Chem. Int. Ed., 2006, 45, 3851-3854. Ako, T. et al. Chem. Asian J., 2006, 1, 798-813. 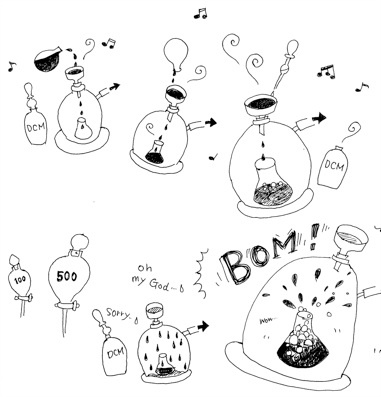 A new catalyst for the hydrogenation! 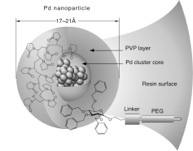 A stable nanoparticle of Palldium(0) is very much stronger catalyst than ordinary Pd/C, and it works for solid-phase synthesis. We confirmed this particle is stable for more than 10 years as a solution. Kanie, O. et al. Angew. Chem. Int. Ed., 2000, 39, 4545-4547. A non-destructive method of quantitative monitoring of solid-phase synthesis. A set of stable isotopes were used to monitor the reaction course where one is used as "a stationary beacon". Kanemitsu, T. et al. Angew. Chem. Int. Ed., 1998, 38, 3415-3418. Kanemitsu, T. et al. J. Am. Chem. Soc, 2002, 124, 3591-3599. Kanemitsu, T. et al. J. Carbohydr. Chem., 2006, 25, 361-376. 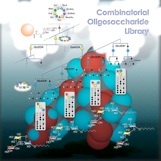 A most challenging chemistry, synthesis of a combinatorial oligosaccharide library. Suzuki, K. et al. J. Carbohydr. Chem, 2005, 24, 219-236. Ohtsuka, I. et al. Carbohydr. Res., 2006, 341, 1476-1487.